WASHINGTON (October 14, 2014) – States can cost-effectively produce nearly twice as much renewable electricity as the Environmental Protection Agency (EPA) calculated they could under its Clean Power Plan, according to a proposal from the Union of Concerned Scientists (UCS). The science group found that increased renewable electricity growth could allow states to collectively cut heat-trapping carbon emissions from power plants 40 percent below 2005 levels by 2030 rather than the 30 percent reduction EPA included in its draft rule. Overall, the EPA calculated that renewables could comprise 12 percent of U.S. electricity sales in 2030, marginally more than business-as-usual projections from the Energy Information Administration. If fully implemented, UCS’s proposed modified approach for setting state targets would result in renewables supplying at least 23 percent of national power sales by 2030. UCS’s analysis found that seven states are already producing more renewable electricity than the EPA computed they could in 2030 under its draft rule. Additionally, 17 states have existing laws that require more renewable electricity than EPA’s targets. UCS’s proposal uses a more ambitious formula for setting renewable targets based on recent renewable electricity growth rates and state renewable electricity requirements; it also assumes a conservative long-term annual growth rate for renewables of between 1 and 1.5 percent of electricity sales for individual states. By contrast, the EPA’s draft proposal assumed that renewables would grow by a fraction of a percent per year based on averaging state renewable electricity standards across regions. The analysis also found that increasing the share of renewable electricity is affordable. Nationally, the UCS proposal for increasing renewable electricity would have minimal impacts on electricity bills, amounting to no more than 18 cents per month for a typical household. UCS’s modified approach results in small net savings in some regions and small net costs in others. The analysis found that diversifying the electricity mix with renewables helps reduce the growth in power sector natural gas prices by approximately 9 percent by 2030 and lowers consumers’ natural gas bills. Renewable electricity is one way states can comply with EPA rules, along with power plant efficiency, fuel switching to natural gas, nuclear power, and making homes and businesses more energy efficient. States can combine these options to meet EPA emissions targets. In addition to emphasizing cost-effective renewable energy production, states can also enter into agreements with one another, such as the Regional Greenhouse Gas Initiative, to find the lowest-cost carbon reduction options. 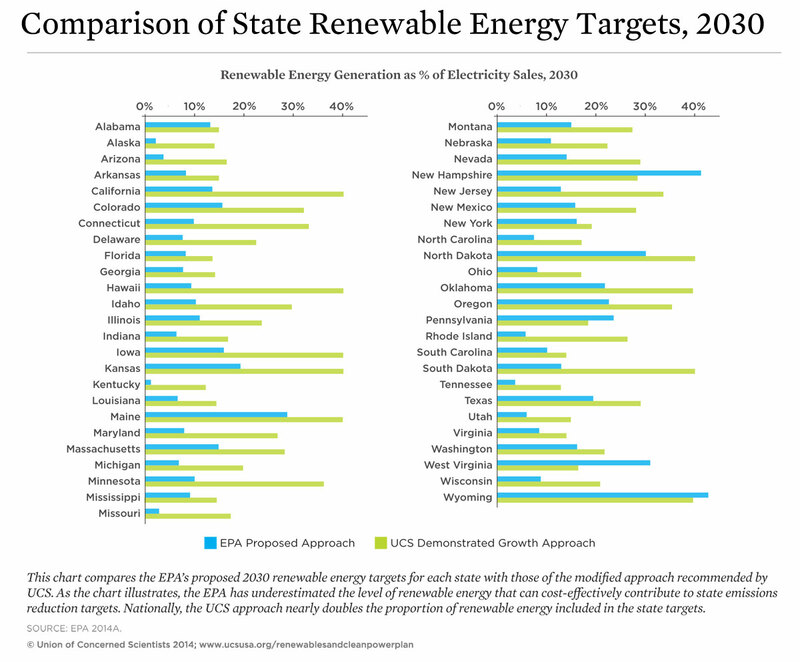 The analysis includes a chart comparing the amount of renewable electricity in each state by 2030 under the EPA approach and the UCS approach.